1. What is iPhone 5S/5C/5/4S/4 Backup File? Every time you connect your red iPhone 7Plus/7/SE/6plus/6/5S/5C/5/4S/4 to your computer, iTunes will allow you to back up your iPhone. This is the iPhone backup file which will be automatically saved on your computer. 2. Where is iPhone 5S/5C/5/4S/4 Backup File Location? Note:iPhone backup files are unreadable since they are SQLITEDB file. 3. What is the Importance of iPhone 5S/5C/5/4S/4 Backup File? 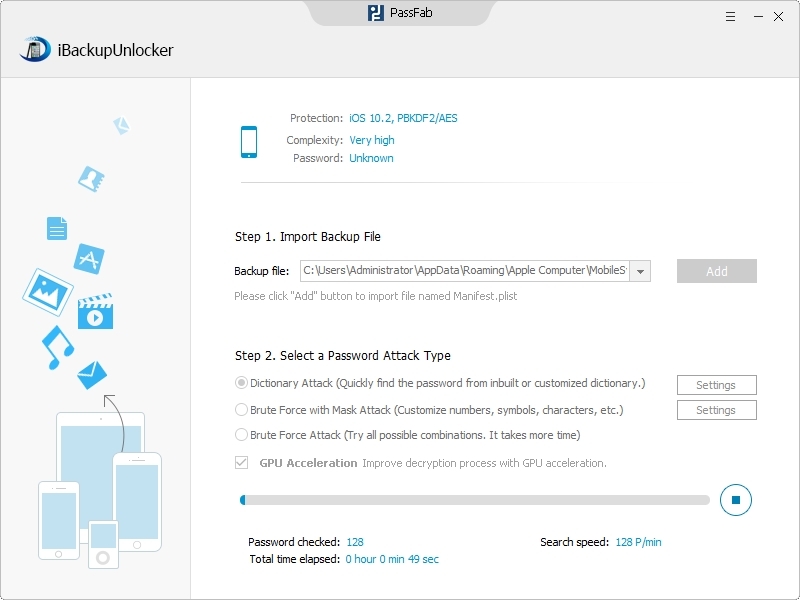 iPhone 5/4S/4 Backup File can protect you from losing your iPhone data accidently forever. Loss can't be foretold and avoidable. If you choose to back up your iPhone file first, you can get the access to restore from the iPhone backup file. 4. How to Encrypt iPhone 5S/5C/5/4S/4 Backup File? Moreover, in the process of backup, you are highly recommended to choose a password to unlock iPhone backup file to protect your privacy, which is iTunes backup password. Just click "Encrypt iPhone backup" and put the password in the pop-up window. Thus if you want to restore from the backup files afterward, you must enter the iTunes backup password. 5. 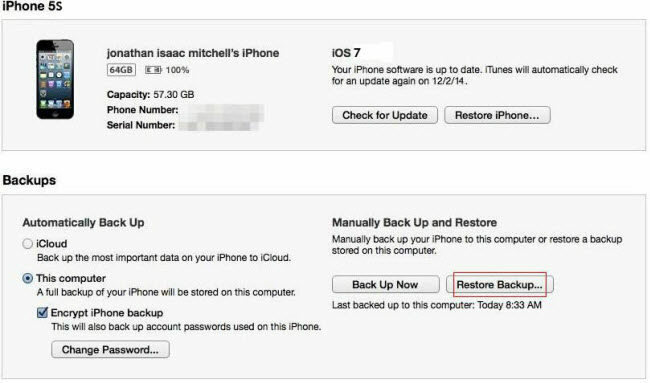 What Matters if You Forgot Encrypted iPhone 5S/5C/5/4S/4 Backup File Password? If you forgot the password, you can continue to back up and use the device, however you will not be able to restore the encrypted backup to any device without the password. 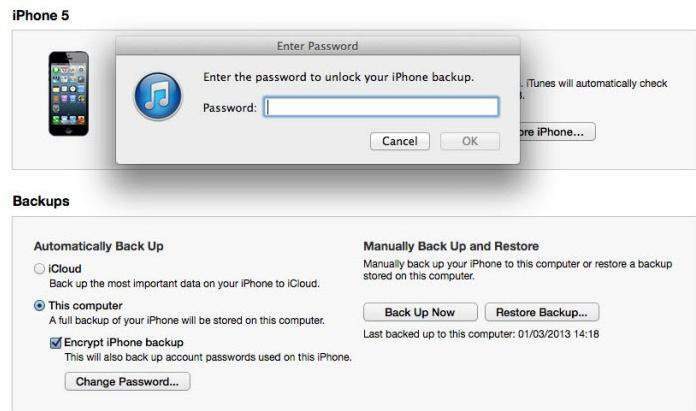 Thus, you need iTunes Backup Password Recovery to help you reset iPhone backup password. 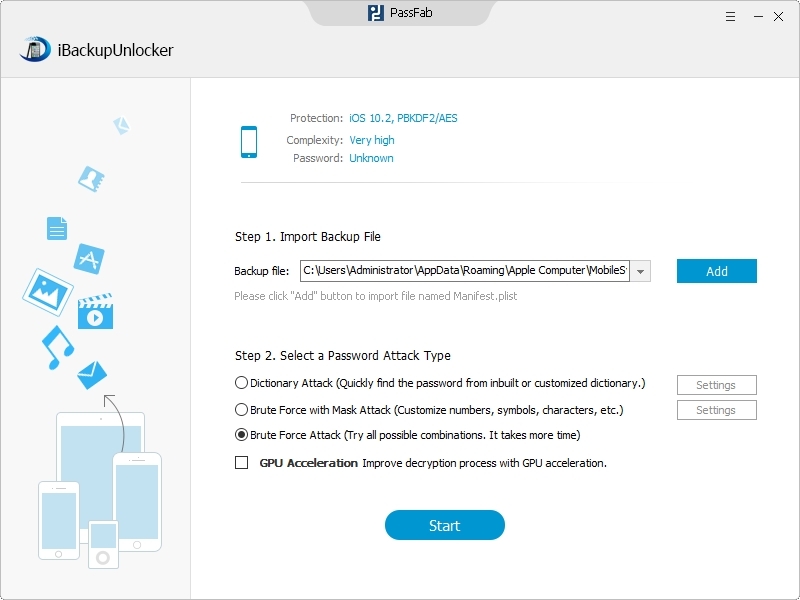 6.How to Recover the Password to Unlock iPhone 5S/5C/5/4S/4 Backup File if You Forgot it? Following are the detailed tutorials to you to recover the password to unlock iPhone 5S/5C/5/4S/4 backup file with the best iTunes Backup Password Recovery. 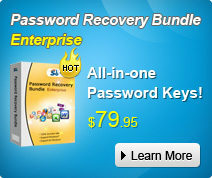 It allows you to recover the password with only a few clicks. Step 1. Run iTunes Backup Password Recovery and click "Open". The file you want to recover will be displayed automatically. Step 2. Choose the Attack type. Step 3. Click "Start" to recover iPhone backup password. 7. 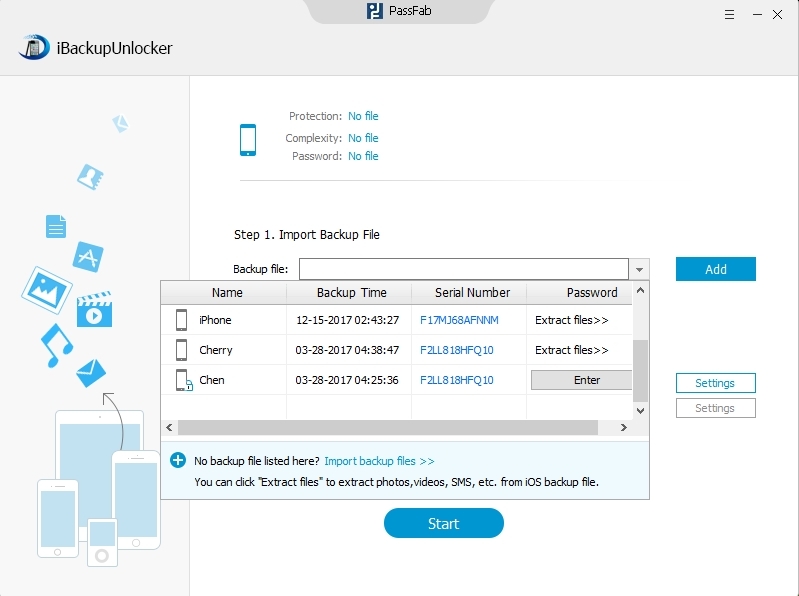 How to Restore from Encrypted iPhone 5S/5C/5/4S/4 Backup File? After cracking the iTunes backup password, you can restore the file from iPhone 5/4S/4 backup file with great ease. 1. Connect your iPhone to the computer that you normally sync it to that contains the backup file. 2. Enter the decrypted iPhone backup password to get access to the backup file. 3. In the center of the iPhone management screen, click the "Restore" button. Try to remember the iTunes backup password this time, or you can turn to iTunes Backup Password Recovery for help if you forgot it. Moreover, try to understand all the tips for iPhone backup file. Access to password-protected backups for iOS devices including iPhone, iPad, and iPod.